WOW! This could shake up the whole organization. The Arizona Coyotes are awful. It’s not even a matter of opinion… their 2-14-3 record is by far the worst in the NHL and they’re on pace for a historically bad season. So… how could things get any worse? Well, their top player could hit the trade market? 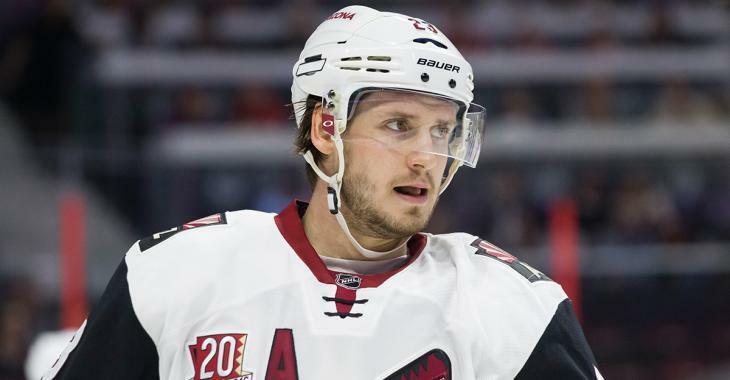 In his latest article for The Hockey News, analyst Jared Clinton dissects the Coyotes situation with pending free-agent Oliver Ekman-Larsson and looks at the potential return that the team could get in a blockbuster trade for the blue liner. Recent history would suggest he’d land the Coyotes one heck of a return, though. Kevin Shattenkirk, for one, netted the St. Louis Blues two prospects and two high-round picks. Matt Duchene, while he plays a different position, just landed the Colorado Avalanche seven pieces, including first-, second- and third-round picks and three noteworthy prospects. You have to imagine that the asking price on OEL would be even higher than Kevin Shattenkirk, given his two-way pedigree. Would a team be willing to offer up multiple high picks and prospects for the Norris Trophy nominee? But the question really is… would the Coyotes move him? Coyotes GM John Chayka has insisted all along that he’s not interested in moving him. That’s all well and good, but what if Chayka gets an offer he simply can’t refuse? Expect several teams to line up their best offers should the situation change in Arizona.